“How do you get so much reading done?” I am frequently asked by colleagues. Well, number one is that I am passionate about staying up-to-date with the literature-both children’s and professional. This year I now have a number two-my daughter is on a swim team and when we go to a meet, we are often there for six hours. Now these meets are not a hardship of any kind to me because I get to hang out with my daughter all day without the distraction of a phone or computer. I also get TONS of reading done while I’m waiting to watch her swim her event. I can tune out all the buzzers, crowd, etc. and concentrate on the book. I usually take one professional book and one Kidlit book along and make myself go back forth chapter by chapter. Saturday’s meet was one chapter of Teaching with Intention, one chapter of Breaking Dawn. If you know the two books, you know which one I got finished! I really enjoyed Teaching with Intention and think it should be required reading for all those going into education. Debbie Miller is so eloquent and is able to put things into words thoughts I’ve had, but had a hard time explaining to anyone else. She starts the book describing how she had to set up a “classroom” in her basement after retiring so that she had a familiar place to plan and reflect on her writing and seminars. One of the things that hit home right away with me while reading the Introduction was the following statement. “I’m convinced that success in the classroom depends less on which beliefs we hold and more on simply having a set of beliefs that guides us in our day-to-day work with children” (p. 4). I believe that being able to articulate your beliefs is something that many teachers struggle with. To paraphrase Lester Laminack, when teachers begin being treated as pharmacists and asked to fill prescriptions (scripted programs, prepacked materials) dolled out by others (state department, national government), rather than as doctors-those with great knowledge that must use their own judgement to make decisions about their patients/students, part of the greatness of teachers and teaching is being taken away. He compared it to the wizard in the Wizard of Oz-a giant talking head behind a screen with no connection to the reality of most children and their teachers. I believe I was born to teach. I actually did not go willingly. My parents and grandparents were educators and I saw how hard they worked for so little money. I didn’t want a career that involved being overworked, under-appreciated, and underpaid. I started college as a psychology major, but literally one day I woke up my sophomore year and realized that I needed to be a teacher. I never looked back from that day. I love school, children, and everything about the craziness that makes up a classroom, a day, a year in a school. I actually never imagined I would do anything but teach, I loved it so much. Sure there were things that were hard and sometimes frustrating, but I felt called to my job. So you might be asking yourself, “If she loved teaching so much, what is she doing in curriculum now?”. Well that is a good question. When the school year ended last year, I had already been plotting and planning with my friend and co-teacher all the great things we were going to do this year. I’d agonized over where my daughter should be placed in fourth grade. I wanted her to be able to have my co-teacher, but knew it would not be good for her (or me) to have me as a teacher, even if it was one period a day. Well, summer started and my principal was promoted and asked me if I’d consider taking this position to work with him in the district. It was a leap of faith, or if you’ve read the blog earlier, a Scaredy Squirrel moment. I jumped out of the tree and while I can’t fly, I do think that I am very good at this position and needed by the district to help us through at least this year, if not longer. I like working with adult learners and problem solving what can be done to help teachers make their jobs better, and hopefully even easier. End of tangent. “I believe that a workshop format based on the elements of time, choice, response, and community fosters active, responsive teaching and learning.” (Hansen 1987). The book ends with a commentary by Peter Johnston of Choice Words and is definitely worth reading! Overall a great book and a great springboard for professional conversation for a staff. Thanks to Kelly’s comment I now know you can still read the whole book online! This book is phenomenal! I am about to student teach next semester and have been trying to absorb all of the professional literature and veteran advice possible before I jump off into the wonderful deep end. I lived in Denver until 2000, and wished I’d run into Mrs. Miller at some point – I might have entered the education field sooner! Stenhouse, the book’s publisher, has the ENTIRE book available for preview on their website, as well as Ann Marie Corgill’s Of Primary Importance – another gem. I persuaded my university’s library to purchase both books, which they did. I almost wish I had a daughter on the swim team so that I could get more reading time…NOT!!! I enjoyed your review, but also the tangent — I missed the saga of how you wound up in your position! Good for you! Risk taking is a good thing. My son has a very young, extremely awesome 4th grade teacher this year, and he loves school. Teachers are so important. 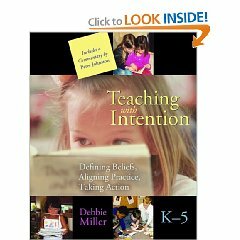 A group of colleagues has chosen to read Teaching With Intention as our summer book study. If anyone out there has done something similar, I’d love to know what guiding questions you may have used! I read it on my own and loved it! It really helped me put words to thoughts/beliefs I had.